From the late 1970s throughout the 1980s and into the early 1990s, four men built an incredible bond. Bob Kiely, Al Rigoni, Bill Sommer and I were professional colleagues, trusted friends and confidants. We worked hard and played harder. We shared personal and professional triumphs and tragedies. We learned from one another and about one another. We were as thick as thieves. We were a "Band of Brothers". The relationships we built were priceless. We were four true friends who could be trusted with our most private thoughts, hopes and fears and who accepted one another for who we were. We really knew one another, the good and the bad, and we drew incredible comfort from the honesty, openness and unstated affection which flowed between us. Some of our most memorable times occurred during the golf trips we took together. It was non-stop fun, a refuge from the everyday pressures we felt as public managers, sons, husbands, and fathers. Those trips helped shape who we would become as men because we learned so much about ourselves, about relationships, about life. The game of golf can be a window to a person's character. It will expose your human flaws, your frailties, your ability to accept triumph and tragedy. The game has the ability to reveal the real YOU. Each putt made, each wayward drive was an opportunity to grow as a person and learn from one another, to grow the bond. We were a "Band of Brothers". Bill Sommer was turning forty years old. We planned a golf trip, (what else) to celebrate! We were going to the Tournament Players Club at Sawgrass in Ponte Verde, Florida to celebrate his milestone birthday. Reservations were made, tickets were purchased, tee times were booked. We looked forward to the trip with great anticipation. On a Tuesday evening at about midnight in the early spring, 1992, the four of us said good-bye in a parking lot in Skokie following one of our many Chicago Bulls games together. We would never see Bill alive again. On March 6, 1992 after coming home from a Village Board meeting in Lincolnwood, Bill Sommer; son, husband, father, friend, unexpectedly and suddenly died of a massive coronary. The enormity of the event was mind numbing because it was so unexpected. The unthinkable had happened. He was the life of the party, the social director. He was the one who would never go to bed at night when we were away from home without calling to say "Good-night" to his children. People like Bill Sommer did not die suddenly at 39 years old. We lost an integral part of our foursome and we did not even have a chance to say good-bye. It hurt too badly to even discuss. The wake and funeral were a blur. It was difficult to see anything clearly through the tears. The emotional upheaval was dramatic. We felt helpless. We had to do something to help ease the pain, to temper the loss, to help Lynn and the children, Annie and Jay. That is when the idea for the Sommer Memorial Golf Tournament was born. We would use the sport that was so important to the development of our bond as friends to remember Bill and provide funds to educate Annie and Jay. The first Sommer Memorial Golf Tournament was held on June 9, 1993 and raised $2,323 for the Annie and Jay Sommer Memorial Fund. Forty-six players participated. It was a labor of love. The outpouring of support from friends and colleagues was heartwarming. A tradition had begun. Our foursome was, however, short a player. The "Band of Brothers" was missing one. Joe Cavallaro filled the void. Joe worked as Bill's assistant in West Dundee and became Village Manager there when Bill went to work in Lincolnwood. Joe seamlessly joined the foursome and has been an integral part of the group ever since. 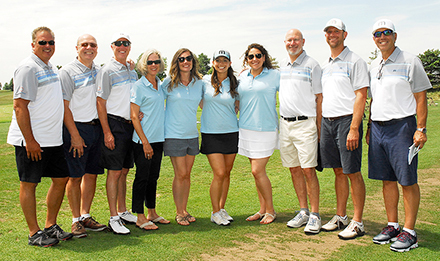 Since the inaugural event in 1993, we have seen 2,686 players participate in the Sommer Memorial Golf Tournament and over $549,000 has been raised to further the education of tomorrow's leaders. Thanks to the sponsors and participants of the Sommer Memorial Golf Tournament from 1993 to 1998; we were able to invest enough proceeds to provide for the future educational pursuits of Anne and Jay Sommer. Our initial mission had been met thanks to the support of many kind people who joined us for our first six tournaments. It was time for a new mission. We decided as a group to transition to providing scholarships to high school seniors who had endured the hardship of losing a parent early in life. We would distribute the scholarships via the newly incorporated Sommer Foundation. High school seniors would compete for a Sommer Foundation Scholarship based upon academic achievement, participation in volunteer and school activities, employment experience, and financial need. Through 2018, 109 scholarships have been provided to students who have gone on to succeed at several different colleges or universities. When the Sommer Foundation Board of Directors was established, Bernie Oglietti and Lynn Sommer joined Joe Cavallaro, Bob Kiely, Al Rigoni, and myself. As the success of the Foundation continues to grow, the decision was made to expand the Board of Directors by three. Robert Irvin, Carol Sente, and Ryan Waller were subsequently elected to these openings. In October 2010, a vacancy to the Board occurred when Carol Sente’s term expired. The Foundation is thankful for Carol’s years of service, and while she will be missed, we were fortunate to receive a commitment from long-time supporter, Peter Koukos, to join the team. In 2012, Anne Sommer and Katie Limardi joined the Board of Directors, continuing the family legacy. It has been an honor and a pleasure for those of us serving on the Sommer Foundation Board of Directors to be involved in the pursuit of our mission. We are so grateful to all of our sponsors and participants for having a positive impact on the lives of future leaders and for helping us remember our friend, Bill Sommer.